Wednesday night: another orchestra rehearsal. Another new piece. It's normal, but at the same time, how do you do it? How do you just get up and move on? This past Sunday my orchestra had its Fall Concert. 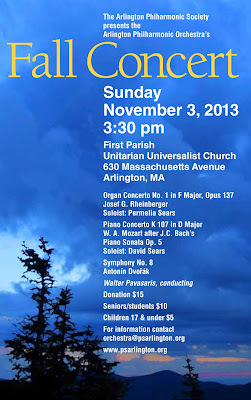 We played three pieces: Mozart's piano concerto K107 in D major, the Rheinberger organ concerto No. 1, and Dvorak's 8th symphony. How young must Mozart have been when he wrote this? Six? All the YouTube recordings are on harpsichord, by the way, and tuned to period tuning, which means down to something resembling A415. If, like me, you try to practice a piece by playing along with a recording a few times, you're in for a painful ear experience. Our orchestra's principal violist is a Yale-trained church organist, as well. I knew that, from my days in the viola section. I admit that I am not a particular fan of organ music, so when I saw this was on the program, I was kind of skeptical. I though, well, at least it's good she has a chance to play her main instrument. And honestly, who the heck is Rheinberger? I should know by now that my preconceived notions about a piece, especially when they are skeptical, are going to be challenged and changed when I play it. There are a lot of things that go into performing an organ concerto with orchestra that you wouldn't expect: how do you give the A, for example? You need someone to give it who knows how to talk to the organ and get it to make a sound. You have to account for the delay in the sound from the organ reaching the orchestra's ears. You have to account for the fact that when performing, the organist is seated with her back to the conductor, halfway across a large sanctuary, and is looking at him in a big round mirror. So rehearsals were a little scary, at least at first. But by the concert the piece was truly glorious, romantic and lush, showing me again that organ music is not just creepy Halloween-y, ghosts-in-the-churchyard type of stuff. It was our conductor Walter's last concert. Walter has been with the orchestra for 33 years. After he announced his retirement earlier this year, the orchestra has been involved in a conductor search, which was recently completed. I'm excited to be working with the new conductor for her (yes, her) first concert in the new year. But I think that's a topic for another blog. She deserves her own space, something new and fresh. When I'm ready. For better and worse, right now it's about me. I've only been in the orchestra for 6 of those 33 years, which makes me a relative newcomer. The orchestra's longest-serving member, whom I've written about before, passed away in September at age almost-97. She knew it was time, and she was ready. We played for her in the nursing home where she spent her final days. She was in the orchestra for 77 years. We dedicated the Dvorak to the memory and celebration of her life. After the concert there was a farewell party, where my string quartet played "Ashokan Farewell." I had played a violin and piano arrangement in church over the summer and so knew the violin I part pretty well. There is a string quartet arrangement available, which I bought and downloaded. With our regular violist out of town, we needed to find a replacement. I was going to do it, but then my stand partner volunteered to play my viola, and we found another second violinist, a fiddler familiar with the piece, someone who's also been in the orchestra for dozens of years. What I'm still having trouble coming to terms with is something that someone said to me as the party was winding down. She said that in order to make music, you have to have your brain on ice and your heart on fire. The truth of that struck me as I thought back over the day. There was so much to remember, from all those details about each piece, to who was getting flowers and when, to getting my music stand over to the party, to when to stand up, when to sit down, what to say before we played our Farewell. My brain had trouble staying on ice through all that. I'd been reluctant to speak at the party, because public speaking isn't really my forte even under the best of circumstances. My speaking anxiety is akin to the performance anxiety I have when playing violin solos. I *can* do it, if I really, really screw up my courage to the sticking place . . . but deep down I'd kind of really rather just . . . not. Still, I thought I should, as concertmaster, and because I had something I really did want to say out loud in front of people. Playing in this orchestra has been, over the past 6 years, a precious gift. Most adult amateur violinists do not get a chance to play their first big solo at age 44, to play a leadership role in a group that performs for love and not money, to make lifelong friends over a shared love of music. Our conductor has shaped the character of the group. He has kept it as one of the last true amateur, non-audition groups in the greater Boston area. The welcoming family atmosphere, coupled with high standards for performance, has been one of his great legacies. I was afraid I was going to get emotional and tear up while I was speaking, and maybe start to babble a little bit and, well, I was right. I did, all of the above. But you know what, it wasn't so bad. Not the tears, not the farewell. Even the playing sounded pretty nice. And, since it was a Sunday night, we didn't make it a long night and were home by 8. In time to watch the Amazing Race, even. And now, Wednesday night: another orchestra rehearsal. Another new piece. It's normal, but at the same time, how do you do it? How do you just get up and move on? A group like that can be very special indeed. I've been in a few now the first one I joined was quite special for me & I'm grateful for the time I spent there. If I remember correctly, this was a farewell for the conductor? Yes, it was a farewell for the conductor. He's retiring from our group but is still active in other educational projects. It's a good step for him, and hopefully for us too, with our chance to work with someone new (and young and dynamic). I think what made it so emotional for everyone is that we all have our own history that we were remembering. My playing the violin again, and continuing as an adult, is all intertwined with being in this orchestra. Brain on ice, heart on fire is a great plan, isn't it! Sharelle, now that some time has passed I'm getting back into it. I know what you mean, I often have the post-concert let-down, and I am surprised by it every time. The Holiday Concert music is a little easier, and it's with the chorale and the chorale conductor. So it's a nice break. The new conductor starts working with the orchestra in the new year. Tomorrow we still have the memorial service for Phyllis, who passed away in September. The service is being held on what would have been her 97th birthday. The quartet is playing again, Schubert and Mozart this time. A lot of endings and changes and farewells.